Raised in Michigan, Dr. Barkan couldn’t wait to live the dream of going to the University of Michigan in Ann Arbor where he completed his BA in Political Science in 1992. After graduation he spent time living and traveling in Israel and Europe, before serving in the United States Peace Corps. During his Peace Corps service, he completed extensive training in freshwater fish culture and public health, as well as language training for both French and Sango. He served in Burundi and The Central African Republic. Dr. Barkan recalls sitting on a bench one afternoon in his village helping a child with his biology studies, and realizing at that moment how much he enjoyed science and wanted to become a doctor. Upon completing his time in the Peace Corps, Dr. Barkan returned to the University of Michigan for his medical degree. While there, he organized student activities to support the Children’s Hospital, earning him an award for community service within the medical school. He also directed the medical students’ satirical show, “Joseph and the Amazing Mono-color White Coat.” In 2000, Dr. Barkan received his medical degree from the University of Michigan’s Medical School. He finally moved out of The Great Lakes State to complete a pediatric residency at the Cohen Children’s Medical Center of North Shore-LIJ Hospital in Queens, New York. 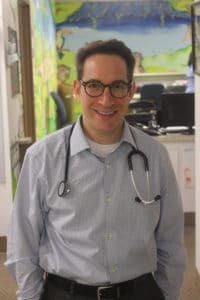 After a two-year stint as a pediatric hospitalist at St. Barnabas Hospital in The Bronx, NY, Dr. Barkan made his way to the Philadelphia area, where he has spent the past 11 years practicing general pediatric medicine. Most of that time has been dedicated to the care of families and children in Northeast Philadelphia. In addition to caring for the entire age range of pediatrics, from newborns to college students, he has especially enjoyed supporting new parents and all of the challenges they encounter, managing asthma and coaching families struggling with obesity. Outside of the practice of pediatrics, Dr. Barkan enjoys running, cooking, and is especially engaged in the Jewish community of Mt. Airy, Philadelphia.